It’s been almost a year since Haim released its first single, “Forever,” the track that garnered the trio of California sisters a ton of hype just for singing about an intimate yet universal experience—a relationship’s do-or-die moment. “Forever” has since become the second track on Haim’s debut, Days Are Gone, and creates the lovelorn landscape of an album filled with subject matter that will surely resonate with the recently single. Days Are Gone’s third single, “Falling”—about getting “rough” when relationship times are tough—follows the same formula. 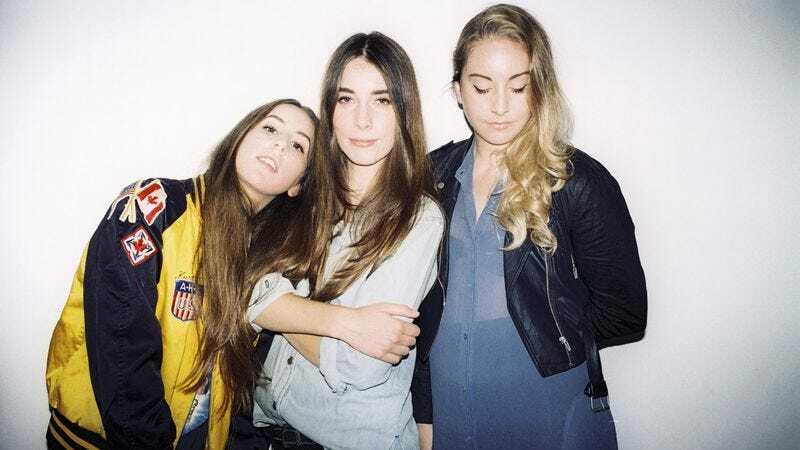 Middle sister Danielle Haim sings a somewhat restrained lead over a mix of upbeat folk and R&B, while oldest sister Este Haim and youngest sister Alana Haim provide perfect backing harmonies à la the Christine McVie-led version of Fleetwood Mac. It’s not until the album’s third track and latest single, “The Wire,” that listeners are given extended vocal contributions by Este and Alana. The Eagles-esque song sees Danielle receding to the background after the first verse before returning to the fore later on. It’s a nice change of pace that conveys Haim’s versatility, making for some of the album’s strongest songs as Days Are Gone’s second half shifts from peppy, hook-laden numbers to songs with stringent rhythm and somber lyrics. “My Song 5” exemplifies this shift. The hard-hitting tune still showcases what seems to be an effortless ability from the Haim sisters to craft a catchy melody—surely a result of their musical upbringing, complete with participation in the parent-led family band Rockinhaim—but the amount of instrumentation is more varied; the synth-heavy first half of Days Are Gone is replaced by some of the album’s most overt guitar work. Penultimate cut “Let Me Go” hits the same sweet spots with harsher beats and repeated pleas to a lover that swell into assertive verses. The arrangements throughout, however, provide enough pop to keep even the darker parts of the album danceable. It could be an overstatement to say that if Days Are Gone is any indication of what’s to come for Haim, the band is set. The twentysomethings are still young, after all, and will no doubt change their style as new experiences color their view. Still, Days Are Gone is remarkably solid and—forthcoming changes or not—with all the hype and talent behind the group, Haim is overwhelmingly likely to succeed.